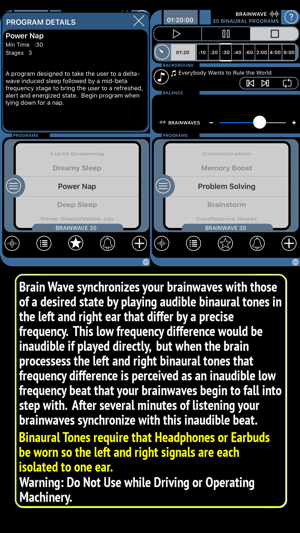 - To use Brain Wave with Spotify or an Audio Book Reader start the other app first and then ours. 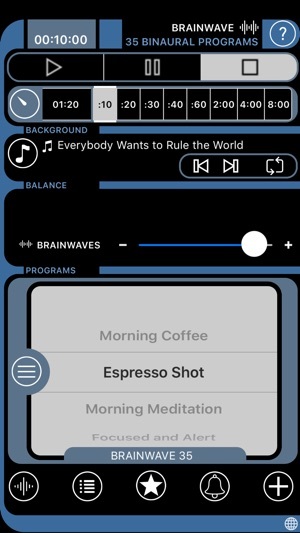 To listen with a podcast, start Brain Wave first. - Program duration is fully adjustable. If the program has multiple Binaural Stages the individual stages will be lengthened or shortened accordingly. 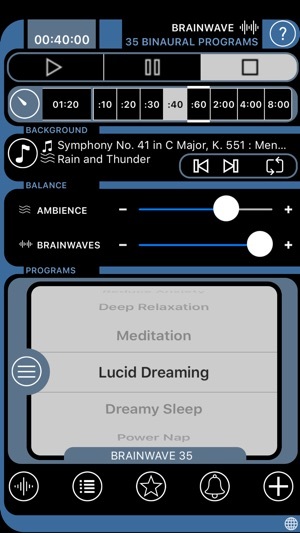 - Programs use composite Binaural Tones that stimulate multiple brainwave frequencies to create combination experiences, such as Power Nap, Pre-Exercise Energy, Dreamy Sleep, and Positive Mood Boost. - Each program goes through a progression of binaural beats, each for a specific period of time sufficient to synchronize your brainwaves with the binaural tones. - 35 Advanced Binaural Brainwave Entrainment Programs to use throughout the day. - Multiple program durations (10 min, 20 min, 30 min, 40 min, 1 hour, 2 hours, 3 hours, 4 hours, 8 hours). You can also set your own custom duration. 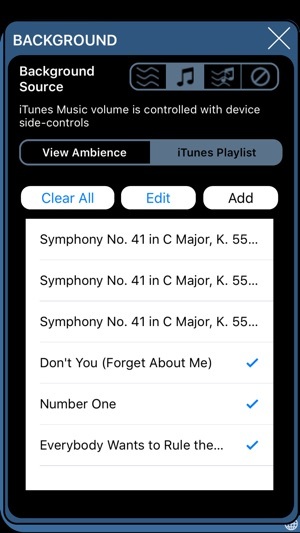 - Use the included Ambience or create a playlist of your own iTunes Music to use with each program. 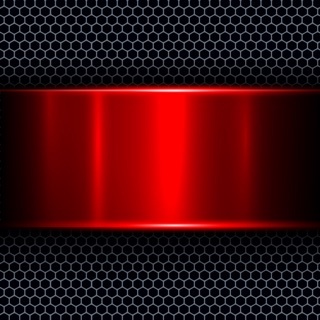 Your brain will process the binaural frequencies played over these background sounds. Binaural Tones are more effective with background audio than alone. 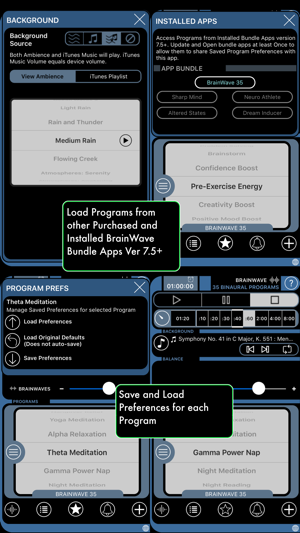 - Save preferred settings, including background audio, iTunes playlist, Alarm settings, and volume for each Brainwave Program. 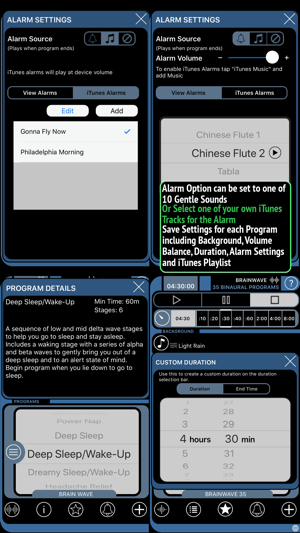 - Choose from one of the 10 gentle alarm sounds, or select your own iTunes Music track. * Binaural Brainwave entrainment should not be used while driving or operating machinery. Thanks for making BrainWave the top-selling brainwave entrainment app in the App Store for 8 years. 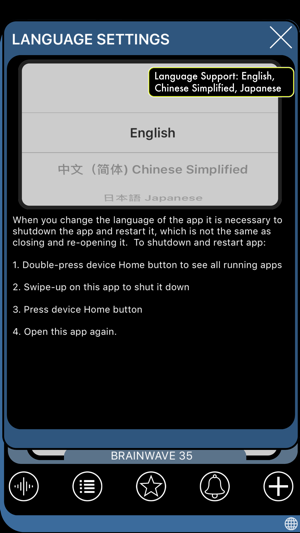 This version includes language translations for Chinese Simplified and Japanese, as well as minor bug fixes. 1) Double-tap the device home button to bring up the list of current apps. 3) Start the app again. I'll Be Using This App Often. 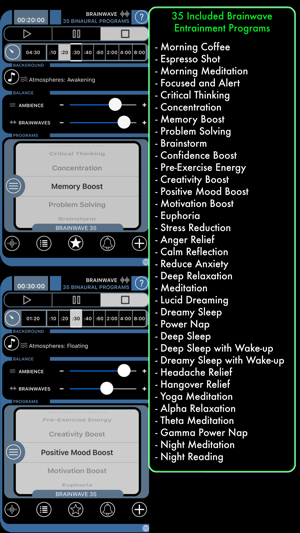 I've had this app on my phone for sometime, with the intention of using it as an aid for parasympathetic body work. I finally started using it yesterday. I've been listening to it now for a few hours (Deep Relaxation with Peace background), and so far I'm impressed with how well it works. I look forward to trying the other programs. I hope the results are as impressive and useful. Even if they aren't, the results I'm experiencing today made downloading this app one of the best tools I've acquired to step away from the perpetual, health destroying, running myself ragged mindset that our culture has ingrained in us. I went to a weekend meditation seminar and resolved to meditate more often. I also wanted to sleep better. 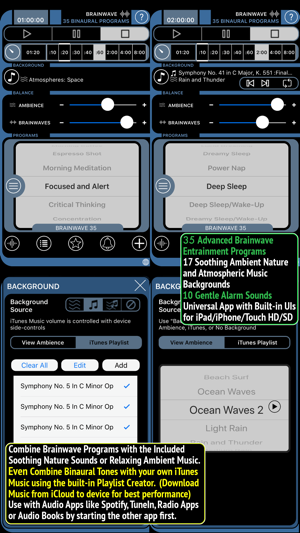 I purchased Brain Wave, Mind Tuner, Perfect Sleep, Tranquil Mind, Brain Beats, MyCalmBeat, Perfect Sleep, Deep Sleep, and My Meditation. I tried them all and, to some extent, they all work. 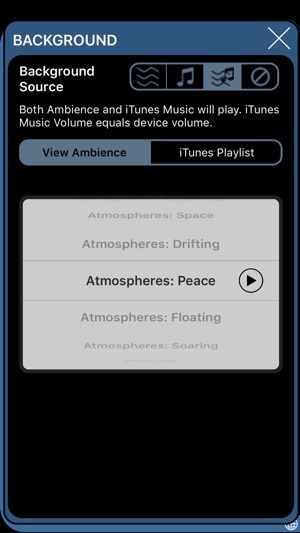 You can also select a background ambient noise and the sound level. Unlike all of the other programs, you can select how long you want it to run. I now meditate every morning and Brain Wave and Mind Tuner have been reliable and helpful. Perfect Sleep has been very effective. I have been getting up twice or three times a night and sometimes it difficult to fall back to sleep. Now I listen to Deep Sleep for 15 minutes, take it off when it's done and immediately fall asleep and stay asleep for at least 3-4 hours. If I awaken, I easily go back to sleep. Although I like Deep Sleep, the hypnosis simply is not as effective for me as the binaural beats of Perfect Sleep.